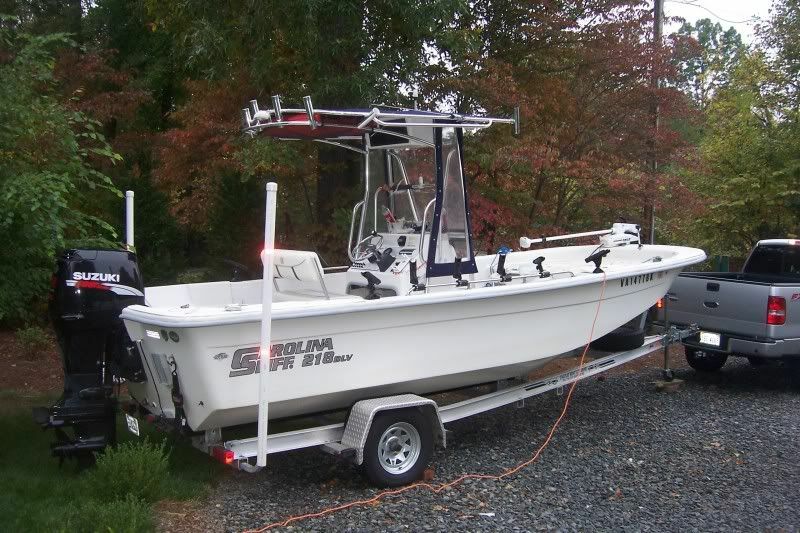 I'm selling my single axle trailer to move up to a tandem with brakes for my skiff. It is a 2007 Wesco single axle aluminum trailer with a torsion axle. I think it is rated for 3600lbs and a 19-21ft boat. I bought new tires and wheels for it last year and they have one trip to the Ches. Bay on them and very little use around here since my boat's been in a slip since October last year. There's a spare also. It has been used in the salt some and there is some slight corrosion on the bottom of some of the u-bolts but nothing too bad. It has the white guide on poles, as well as the glide on slicks for easy loading/unloading. I've replaced almost every light on the trailer with LEDs also. I'm asking $1500 OBO. If anyone is interested, shoot me a PM. It can be seen at Smith Mountain Lake. I don't have just a trailer picture yet, but here's one with the boat sitting on it.